Take the plunge on your wedding day! Most bridal couples don't count on a wet day for their wedding. While some ceremonies are wet by design, the majority are created when nature interrupts their plans. It's imperative for a couple to plan for rain or shine on their wedding day, especially those hosting an outdoor venue. A wet wedding ceremony is the perfect choice for couples who love the water. For these couples, getting married on the beach or next to a lake or pool is not enough - they need to actually be in the water to have their wedding dreams fulfilled. A location, officiate and proper permits may take some time to secure, so start planning the ceremony early. Have a change of clothes and towels available so that after the wet portion of the wedding is over, you can enjoy the reception in dry attire. Plan to have a few extra towels or umbrellas for guests who get a little splashed. Host the ceremony in a swimming pool, stream, lake, ocean or even city fountain. Get married underwater with a snorkeling ceremony. Swim with the dolphins or other fish by getting married in a tank at an aquarium. Not all guests or bridal party members necessarily want to get wet, so it is best to consider locations that allow standing or seating outside the water area. Make sure you label any areas "splash zones" if there is potential for getting a few drops of water in those seats. Discuss these options with a photographer before the ceremony. Some photographers may not want to do this type of wedding, while others want to prepare ahead of time. The photographer may need to bring additional equipment to keep his camera from getting water damaged. While some couples want to get wet, others find themselves wishing away the water. 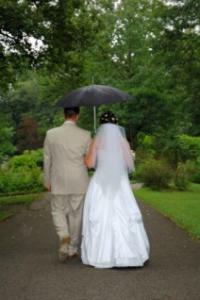 Careful planning can help brides avoid getting soaked on their special day. Wedding day weather is usually the culprit, but other circumstances can also play a part in soaking the ceremony and reception. Planning an outdoor wedding usually begins months, even years, in advance of the actual wedding date. Therefore, it is always good to have a backup plan in case the forecast shows gray skies and rain for the wedding day. Start with a plan to have either the ceremony or reception indoors. This way, you can do a quick room change if the weather takes a turn for the worse and you need to move the other portion of the wedding inside. Keep costs down and still avoid disaster by putting down a deposit on a wedding reception tent. Make sure you find a place with simple cancellation rules and that they are in writing. If the forecast is sunny and bright up until 24 to 48 hours before the event, you may be able to cancel and get a refund. However, if the forecast is for bad weather, you can plan to host the ceremony and reception inside the tent. Finally, add a few fun aspects to your wedding plans if rain is typical to your area in the season you plan to marry. Give the bridal party galoshes to wear and have a set on hand for yourselves. Place umbrellas at the end of each row of seating in color coordinated designs. Have covers available for food to keep rain sprinkles out of the dishes and rent tables with attached umbrellas for guest seating. Despite all of the planning, sometimes everyone does end up getting wet. Go with the flow and remember that the most important thing is that you are now married to the love of your life.